Once you and your family have agreed that it’s best for your loved one to move into an assisted living facility and you’ve found the best fit for their needs, the next step is to prepare for the move. But what can you do to help make the transition simpler for them, and make the changes as easy to handle as possible? Here are some of our tips to help it go smoothly. Help Them Choose Important Items to Bring – Talk with your loved one about what items they want to bring with them to help decorate their new home. Some people choose to purchase new furniture which is fine but ensure that some familiar items come as well. Whether this is a favorite chair, a comforting blanket, or a collection of books, whatever brings a sense of happiness and ease should come to the new location. A good gift idea would be to purchase some new items that your loved one enjoys, such as books, knitting supplies, or movies to have ready at their new home when they arrive. Move Their Belongings in A Day or Two Early – If at all possible, move all the furniture and belongings a few days before your loved one is due to arrive. This way, you don’t have to worry about any last-minute tasks or assembly when they come and instead can focus on helping them settle in and relax. Bring Them to Several Meals or Activities – Visit the community before your loved one is due to move in and partake in some of the meals and activities that are going on. This helps to allow your loved one to meet some of the residents, get accustomed to how things work in the facility, and get over the fear of the unknown. Take Them to Meet Staff Members – Bring your loved one around the community to meet the important staff directors and coordinators, as well as the individuals who they will see daily such as those that will be responsible for their care. This allows them to become more familiar with the people they’ll interact with and their future home. Talk About the Positive Parts of Moving – As moving day gets closer, be sure to focus on talking about all of the great opportunities your loved one will have once they move. For example, they will get to meet new friends and participate in a variety of activities. At one of your visits, ask for an activities calendar so you can suggest to your loved one some of the activities they will enjoy. Speaking about the move positively will help them look forward to it. Schedule Days and Times to Visit – Your loved one may worry that once they go to the assisted living facility, their family will stop coming to visit. Let them know that this isn’t the case by scheduling specific days when you’ll come by to visit. Sit down and eat a meal with them when you visit to add a comfortable homey element to your visit as well if possible. If they have memory loss issues, consider bringing a guest book or purchasing an instant camera to leave memories of each visit for them. Knowing when they can expect you to come by can help them feel more relaxed. Wyndemere Woods provides three chef prepared meals a day to our residents. We have staff on call 24/7 to keep all our residents safe and cared for. We offer a wide selection of games, classes, crafts, activities, and excursions to encourage seniors to enjoy themselves and interact with one another, as well as our staff. We take care of each one of our residents like they are our own family. 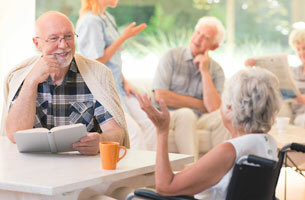 How to Choose an Assisted Living Facility to Retire?